“Hush”: When BUFFY THE VAMPIRE SLAYER Went To A Quiet Place | Birth.Movies.Death. A Quiet Place comes out this week. Get your tickets here! Years before monsters, demons et al. became TV staples, the WB’s (and later the CW’s) Buffy the Vampire Slayer gave them a weekly place to play—if not a safe one, thanks to the title heroine. After three and a half seasons of bloodsuckers and other badly behaving beings, the show upped its game with the “Hush” episode, which featured arguably the freakiest creatures ever seen on the series. Beyond that, their particular m.o. occasioned a unique and daring approach to the storytelling—one that robbed the characters of their voices. In “Hush,” which first aired December 14, 1999, Buffy and friends’ home of Sunnydale is invaded by the Gentlemen: gaunt, pale fiends with perpetual evil grins and impeccable Victorian dress (described by series creator and episode writer/director Joss Whedon in his script as “Nosferatu meets Hellraiser by way of the Joker”). They’re out to relieve young people of their hearts, and to assure that their victims can’t scream, they black-magically steal the voices of everyone in town. While the quarantined Sunnydale deals with this affliction, Buffy (Sarah Michelle Gellar) and her “Scooby gang” must locate and defeat its source without being able to communicate with one another. “Hush” became an instant favorite among Buffy’s fans, critics and even the Emmy voters. Notoriously ignored by those awards in the major categories, Buffy received its one and only Writing for a Drama Series nomination for “Hush,” which also scored a nod for Michael Gershman’s superbly moody cinematography. The episode sees Whedon pull off a trick even he initially doubted he could accomplish: telling a 44-minute tale in which the characters don’t speak for two-thirds of that running time. It grew out of his desire to do something different with the TV medium that was traditionally “radio with faces,” as Whedon puts it in his DVD audio commentary for “Hush.” Without the need for traditional one- and two-shots typically required to capture dialogue, he was free to indulge in pure visual storytelling, with longer takes and camerawork motivated by the action. The lack of sound, beyond Christophe Beck’s terrifically eerie score, serves to amplify the horror of the situation. Nothing makes a nightmare scenario more frightening than the inability to scream for help, and “Hush” reaches its horrific apex when they claim their first onscreen victim, a boy attacked in his own dorm room. As he is held down by the villains’ Footmen, who resemble deformed asylum escapees in open straitjackets, the Gentlemen go to work on him with blades and he vainly attempts to cry out—a setpiece inspired by a dream Whedon once had, and that is still chilling upon rewatching nearly 20 years later. Then there are the Gentlemen themselves, as conjured up by makeup effects creator John Vulich and supervisor Todd McIntosh. This memorably creepy band of supernatural human monsters was spawned from Whedon’s desire to “traumatize little children,” as he puts it in the commentary, and create a kindertrauma for his viewers in the vein of the Zuni fetish doll from the classic TV movie Trilogy of Terror that terrified him in his own youth. In that goal, he succeeded splendidly. Perfectly performed by a quartet of actors and mimes (among them Doug Jones, five years ahead of the Hellboy Abe Sapien role that began his ascent to horror-star status, and Camden Toy, who played the Ubervamp in several subsequent Buffy installments), they remain iconic figures of ’90s tele-terror. Whether gliding implacably after their human quarry or suddenly popping into frame (in a moment anticipating YouTube “screamer” videos), the Gentlemen evoke a sense of fear unmatched by their more elaborately showcased contemporaries. At the same time, Whedon mines his premise for simpler situational suspense, as when Buffy’s boyfriend Riley (Marc Blucas), a member of the demon-hunting Initiative, is trapped with fellow soldier Forrest (Leonard Roberts) in an elevator, unable to use crucial voice-recognition commands. He also takes full advantage of the opportunity to wring non-verbal humor out of the Buffy ensemble’s contrasting and conflicting personalities. A sequence involving Buffy’s Watcher Giles (Anthony Stewart Head) trying to clue the Scoobies in to what they’re facing, and their varied reactions, is a small gem of in-character silent comedy. Get your A Quiet Place tickets here! Michael Gingold has been covering horror and fantastic cinema since his teen years, when he started his Xerox fanzine SCAREAPHANALIA. 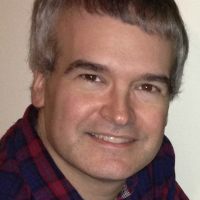 He spent 28 years on the FANGORIA staff, beginning as a writer, becoming managing editor and eventually editor in chief, and is part of the magazine's relaunch this year. In addition to BIRTH.MOVIES.DEATH, Michael currently contributes to RUE MORGUE, TIME OUT NEW YORK and SCREAM magazine. It's BIRD BOX all over again, basically.